An old proverb says that the road to hell is paved with good intentions. Saul Bellow played a riff on that proverb and came up with the idea of the Good Intentions Paving Company. The projects of this enterprise are always well-meant, but when those projects turn out to have undesired costs and tradeoffs and side-effects, the company leaders sincerely believe that none of the blame can possibly attach to them. After all, their intentions were good! "I thought to do some good by giving an interview to People, which was exceedingly foolish of me. I asked Aaron [Asher] to tell you that the Good Intentions Paving Company had fucked up again. The young interviewer turned my opinions inside out, cut out the praises and made it all sound like disavowal, denunciation and excommunication. Well, we're both used to this kind of thing, and beyond shock. In agreeing to take the call and make a statement I was simply muddle-headed. ... Please accept my regrets and apologies, also my best wishes. I'm afraid there's nothing we can do about the journalists; we can only hope that they will die off as the deerflies do towards the end of August." The Good Intentions Paving Company is of course a bipartisan operation, and Epstein offers a range of examples. -- President George W. Bush and many others pushed for the wars in Afghanistan and Iraq in the aftermath of the terrorist attacks of 9/11, with a full range of good intentions including safety for Americans and promoting peace and democracy in the Middle East. Indeed, almost every war and every revolution can be put into effect by the Good Intentions Paving Company. -- The No Child Left Behind legislation surely embodies good intentions. As Epstein writes: "Leave a child behind? Perish the thought. Or so the folks in charge of education at the Good Intentions Paving Co. must have concluded when they instituted their No Child Left Behind program. The program would entail constant testing, would hold the feet of teachers to the fire of palpable achievement, would bring everyone through the primary-grades educational system up to the mark. How bad could that be? Yet again, though, good intentions went askew. The children were educated chiefly to take tests, some school superintendents cheated in reporting their schools' test scores, the teachers unions went ballistic over what they felt were the impossible demands made upon their members. The plan of the Good Intentions Paving Co. once more didn't quite pan out." -- The dysfunctional unfolding of the Patient Protection and Affordable Care Act was clearly another project of the Good Intentions Paving Company. Back when the law passed, it sounded like a plan that would provide health insurance to some of those who lacked it, and to experiment with some ways of bringing down health care costs, while leaving in peace those who liked the quantity and price of their current health insurance coverage. But along the way, it also turned into a Frankenstein's monster of regulations that dictate what health insurance needed to cover and what they can charge in a way that has already disrupted millions of insurance policies in the individual market and next year will do the same to millions of policies in the employer-financed group health insurance market. Of course, once you start thinking about the Good Intentions Paving Company, it's all too easy to multiply the examples. The efforts to support biofuels and green energy projects had good intentions. The War on Drugs had good intentions. Good intentions do mean something: for example, they are usually preferable to bad intentions. And of course, the presence of good intentions do not automatically make something a bad idea. Without good intentions, little would happen in this world. But good intentions aren't enough. For example, a parent who decides that their child shouldn't receive standard vaccinations arguably has good intentions, but it's their judgement that's in question. The fact that the U.S. revolution, the French revolution, and the Russian revolution all had arguably good intentions does not make these events equally defensible. The problem here has several parts. Epstein emphasizes that intentions are not outcomes. If you support an action which leads to consequences, the Good Intentions Paving Company offers only a leaky shelter from criticism. Those who supported the Afghanistan-Iran war bear some responsibility for how it actually turned out, and cannot hide behind their good intentions. The same for those who supported No Child Left Behind, the War on Drugs, and the biofuel and alternative subsidies. And yes, those who supported the Affordable Care Act bear responsibility for what the law actually says and does, and cannot hide behind their generic good intentions that everyone would get additional health care at no extra costs with no disruptions or tradeoffs. I would add another problem, which is that outside of Mother Theresa and Albert Schweitzer, good intentions are rarely pure and unadulterated. Show me a politician who has good intentions that run directly opposite to their political base and personal career aspirations, and I'll consider believing in the purity of their good intentions. I'll also show you a politician who will soon to be out of a job. In other cases, good intentions get tangled up with profit motive. Perhaps health insurance companies had good intentions in supporting the Affordable Care Act, but surely they were also motivated by the notion of millions of new government-guaranteed customers. I'm sure that organizations representing law enforcement and prison guards had good intentions in supporting the War on Drugs, but surely they were also motivated by the higher budgets they received as a result. I'm sure many advocates of biofuels and alternative energy had good intentions, but if those policies had taken money out of various pockets, instead of putting money into those pockets, my suspicion is that their advocacy would have taken a sharp turn in another direction. And in still other cases, good intentions get tangled up with combative instincts about power and control. Policies are presented for public consumption in sugar-coated good intentions, but the underlying motivations also include a health dose of wanting to sock it to the teacher's unions, or sock it to the insurance companies, or sock it to oil companies, or sock it to those who think the government owes them a living. Good intentions about protecting the safety of Americans becomes a politically and socially acceptable way of describing the desire to spy into the personal lives of millions of people. Good intentions about making Americans healthier becomes an acceptable way of telling people and passing laws about what they can eat and drink and smoke. Most of us hold within us a mixture of good intentions that we trumpet to the world and less attractive intentions that we prefer not to examine too closely. Good intentions are seductive. There is great comfort in feeling that those with whom we disagree are corrupted by politics or profit-seeking or darker motives, while our own intentions are of luminescent purity. But after all, the reason that the road to hell is paved with good intentions is that the Devil can quote Scripture for his own purposes. When the policies we favor turn out to have unexpected costs and tradeoffs, perhaps to such an extent that the original wisdom of the policy is called into question, we are likely to disclaim responsibility by taking refuge in our good intentions. I am personally confident that many of my intentions, much of the time, are good. But I am profoundly aware that possessing some good intentions does not provide a get-out-of-jail-free card either for my other motivations, or for the unexpected or undesired consequences of what I support and advocate. 'Tis the season of re-gifting, and so I make bold to pass along this list of 15 of the most popular posts of 2013 at this website, at least one from each month, in reverse chronological order. Of course, I encourage you to spend your holidays surfing the rest of the archives; after all, unless your personal interests are perfectly aligned with pageview popularity (and isn't that a frightening thought? ), you are likely to find other posts of interest, too. "Ultra-Low Interest Rates: Who Wins? Who Loses?" December 4, 2013. "Unavoidable Realities of Insurance: Health Care Edition," November 15, 2013. "The Global Wealth Distribution," November 15, 2013. "The Poverty Rate: Income and Consumption Estimates," September 20, 2013. "Breaking Down the Falling Labor Share of U.S. Income," September 9, 2013. "The Myth Behind the Origins of Summer Vacation," August 28, 2013. "U.S. Higher Education Enrollments, Falling Behind," July 29, 2013. "The Soaring Number of $100 Bills," June 10, 2013. "Labor's Share Falling, Everywhere," June 6, 2013. "Spending on America's Pets," May 21, 2013. "Job Polarization by Skill Level," April 25, 2013. "Is Intellectual Property a Misnomer?" March 29, 2013. "Reusable Grocery Bags Can Kill (Unless Washed)," February 7, 2013. "Head Start is Failing its Test," January 29, 2013. "Does Income Bring Happiness?" January 23, 2013.
International tourism is an underappreciated global industry. Total international tourist trips now top 1 billion per year and $1 trillion in receipts, according to the UN World Tourism Organization, in its "Tourism Highlights: 2013 Edition:" "Despite occasional shocks, international tourist arrivals have shown virtually uninterrupted growth – from 25 million in 1950, to 278 million in 1980, 528 million in 1995, and 1,035 million in 2012. ... International tourism receipts reached US$ 1,075 billion worldwide in 2012, up from US$ 1,042 billion in 2011." over one billion international tourist arrivals. ... China became the number one source market in the world in 2012, spending US$ 102 billion on international tourism." Of course, the U.S. is at a geographic disadvantage in the international tourism statistics, because as a large country with an ocean on either side, and bordering only two other countries, it's not likely to get the same number of international tourists, as, say, smaller European countries where you can drive. To take a not entirely hypothetical example, a beleaguered Minnesotan freezing his toes off in near-zero weather who is thinking about a trip to Florida or Arizona is not counted as an international tourist, but a Swede or German thinking about visiting Greece or the south of France would be an international tourist. Most tourists visit in their own region. Here are the UNWTO stats on the countries with the largest arrivals of international tourists. But it's important to note that when international tourists come to the United States, it is a form of exporting: that is, in both cases U.S. producers receive income from foreign buyers. A McKinsey Global Institute report a couple of years ago looked at opportunities in different sectors for job creation and noted: "[T]o reach the high-job-growth scenario, the United States needs to retake lost ground in global tourism. ... In particular, the United States is not getting its share of tourism from a rising global middle class. 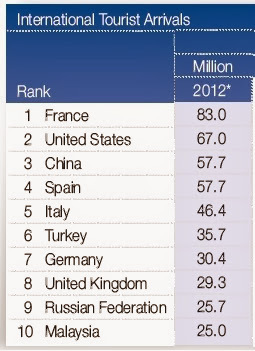 More Chinese tourists visit France than the United States, for example." "International visitors to the U.S. – especially from overseas – stay longer and spend more money than domestic travelers. One particularly important trend in the global travel market is the boom in travel from the rapidly expanding middle and upper classes of the emerging economies in the developing world, countries like Brazil, Russia, India and China (BRIC). While overseas visitors, on average, spend nearly $4,500 per person per trip, visitors from China and Brazil spend much more: $5,200 for Brazil and $6,000 for China. Several of the BRIC countries have shown major passenger increases to the U.S. in recent years (2007–2012), including China (271%), Brazil (180%) and India (28%). These statistics show the importance of the BRIC countries and other emerging markets to global travel growth. Increasing international travel has helped make travel the nation’s largest service export. In economic terms, international travel is counted as an export because dollars come into the country in the same way as they do when foreigners buy American cars, grain or software. Every 33 overseas visitors who travel to America support one U.S. job." My sense is that a lot of Americans still tend to think of the United States as a source of tourists headed other places, but not primarily as a destination for international tourists. Having the rest of the world see how America works (and in some ways doesn't work) is important for many reasons. But international tourism is affected by nonmonetary costs, including the costs of time and energy to fulfill the paperwork in entering the country, as well as the ease with which an international traveler can navigate around the country. In the globalizing world economy, it's time for the U.S. to think about what it would take to roll out the welcome mat for international travelers. Most of the federal budget is spent paying benefits in the so-called "mandatory" programs, where rules are set that (unless or until the rules are changed!) require payments to be made to people meeting certain conditions. But part of the budget is "discretionary" spending on items where the government decides how much to spend each year, and in turn, a portion of that discretionary spending is about investments. 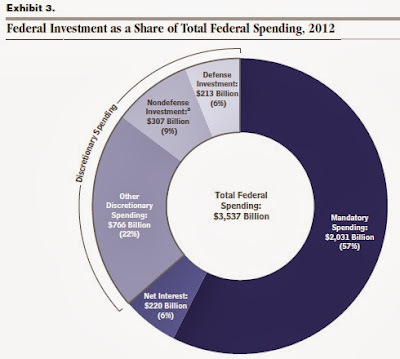 The Congressional Budget Office gives an overview of "Federal Investment" in a recent report. Here's an overview of the spending side of the federal budget. The main examples of mandatory programs are Social Security, Medicare, and Medicaid, but other benefits programs like food stamps or unemployment insurance are also included. 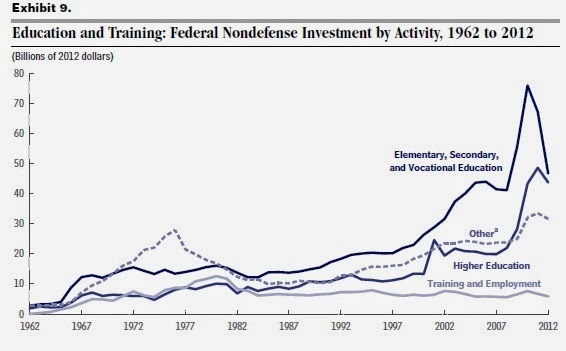 My main focus here is on the non-defense investment programs. While it's true that a few decades back, defense-related research and development often led to civilian products, the more common pattern in the last couple of decades has been that technology advances first in the civilian sector, and then the defense organizations find ways to apply that technology. Over the last couple of decades, defense-related investment has dropped off as a share of GDP. Defense investment is about two-thirds physical capital, like weapons and equipment, and about one-third research and development. 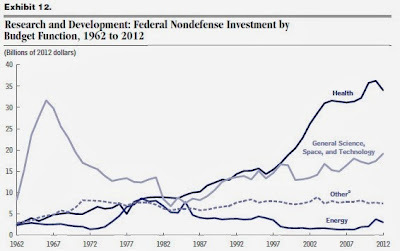 Nondefense investment dropped some in the 1980s, and stayed low until the burst of fiscal stimulus spending in 2009. 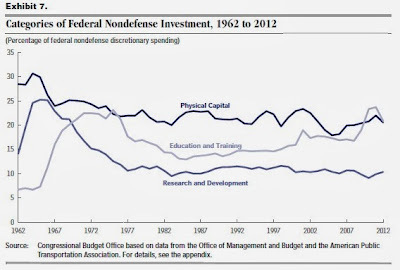 There are three main areas of nondefense federal investment: research and development, education, and physical capital. Physical capital is mainly related to transportation, including both infrastructure and equipment. Within the category of federal R&D investment, you can see that the main area of growth has been in R&D related to health. In contrast, R&D related to science, space and technology dropped off in the 1960s and 1970s. And R&D in energy, for all the hoopla about environmental and national security issues related to energy use, dropped off in the 1980s and has only recently rebounded a bit. Within the category of education and training investment, back in the 1980s federal spending on K-12 education, higher ed, and training and employment were roughly equal. Now, K-12 is out ahead, closely followed by higher ed, with training and employment lagging behind. Of course, it's important to remember that the overwhelming majority of K-12 and higher ed spending in the U.S. happens at the state and local level, not the federal level. 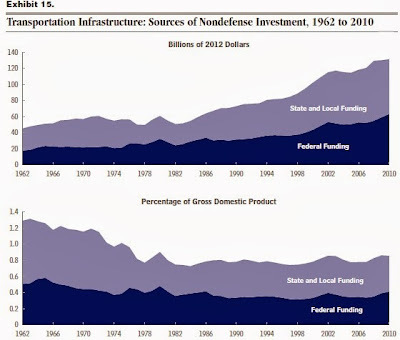 Finally, here's a a figure on transportation infrastructure investment, showing that overall spending in this area has fallen as a share of GDP, and a greater share of this investment is happening at the state and local level, rather than the federal level. Budgets are an expression of priorities. The priority of the federal government is clearly about paying benefits, not about investing in the future. As far as I know, no one disagrees on the need for investing in the future of the U.S. economy. 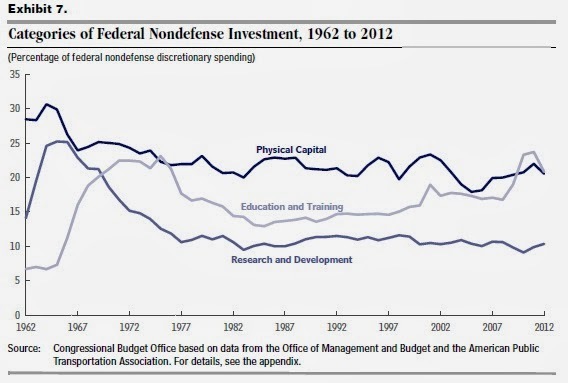 But when push comes to shove, federal investment spending is just hanging on, not expanding. Of course, each individual investment should be evaluated on a cold cost-benefit basis. But is it really the case that there is no cost-benefit argument for higher research and development spending on science and technology and on energy? No cost-benefit argument for higher federal spending on training and employment programs at a time when unemployment has been high and wages for low-skilled workers have been lagging? No cost benefit argument for more spending on transportation infrastructure at a time when so many roads, bridges, airports, and seaports are overcrowded and physically wearing out? My sense is that in many of these areas, the federal government has for decades been pulled toward paying benefits in the present, rather than seeking out ways to invest in future growth. The Federal Reserve: Was it a Mistake? The Federal Reserve reached its 100th anniversary this year, which can be both a time for thinking about what has happened, or for thinking about what might have been. But if you are looking for what is in some way an even bigger-picture discussion of the Fed, the November 2013 issue of Cato Unbound tackles the issue: Was the Fed a mistake? 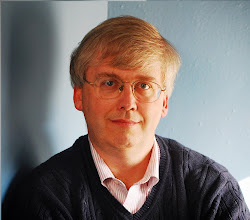 the main essay is written by Gerald P. O'Driscoll, and then comments follow from Lawrence White, Scott Sumner, and Jerry Jordan. O'Driscoll summarizes a theme that runs through the essays this way: "The 19th century economic journalist and Economist editor Walter Bagehot thought it would have been better if the Bank of England had never been created. In Lombard Street, Bagehot argued that a decentralized system of many banks of approximately equal size would have been preferable. ... Bagehot’s famous dictum that Bank of England must lend freely at penalty interest rates in times of panic was a second-best solution to a problem caused by centralizing reserves in that institution. Having said that, Bagehot argued that, once created, it was not possible to abolish central banking." Similarly, O'Driscoll argues that while certain banking reforms were needed back in 1913, the creation of a central bank was a mistake--albeit a mistake that it may not now be possible to reverse. What does the case against the Fed look like? For substantial portions of the Fed's history, its main role has been to help the federal government borrow: obvious examples include during and after World War I, during and after World War II, and during and after the Great Recession. Indeed, O'Driscoll argues that one main reason for the creation of central banks is that they enable high levels of government borrowing, which then impose later economic costs. At other times in Fed history, its actions have contributed to sometimes quite severe swings in business cycles. For example, misguided Fed policies probably contributed to the large business cycle swings of the 1920s; to the Great Depression of the early 1930s and the steep recession of 1937-38; to the "stagflation" combination of inflation and recession in the 1970s; and to the climate of overborrowing that created fertile soil for the Great Recession. By O'Driscoll's reckoning, the Fed has had about 30 years out of its first century when it wasn't either just a mechanism for high government borrowing or wasn't enacting deeply misguided policies: the 1950s, and the period from the mid-1980s to the mid-2000s. In short, this indictment runs, it is at a minimum not obvious from the historical record that the Fed has offered more benefits than costs. Of course, a natural response to this charge to say something like: "Well, I just can't imagine not having a central bank. Everyone who's anyone has a central bank." But a lack of imagination in thinking about alternative monetary institutions is not much of a defense of the current central banking institutions. O'Driscoll argues that a modern banking system does need constraints, so that the banks don't run amok in overborrowing and create financial instability. He suggests a commodity standard, like a gold standard, as such a constraint. My own sense is that a modern central bank--that is, not the Fed as it existed in the 1920s and 1930s--is clearly preferable to a commodity standard. Moreover, in the extraordinarily complex world of modern finance, I don't think a commodity standard would be anywhere close to a sufficient level of financial regulation. But there is also no reason to expect that the Fed will stand still in its goals and tactics. The history of the Fed over the last 100 years shows lots of change and evolution over time. Back as recently as 1994, for example, the Federal Open Market Committee just took actions to adjust the federal funds interest rate, but did not release any statement explaining why. Of course, the Fed has also shown a high capacity for innovation (for better or worse!) during the Great Recession and since then, by announcing that a policy of near-zero interest rates would be sustained into the future and through its quantitative easing policies of buying Treasury debt and mortgage-backed securities directly. I don't expect the Fed to be abolished. But I wouldn't be surprised if the Fed in a decade or two is operating in substantially new and different ways. "[A]s I have always held it little Short of criminality to anticipate evils I will allow it to be a good comfortable road untill I am compelled to beleive otherwise." "I crossed a Deep holler and assended a part of the plain elivated much higher than where I first viewed the above Mountains; from this point I beheld the Rocky Mountains for the first time with certainty, I could only discover a fiew of the most elivated points above the horizon, the most remarkable of which by my pocket compas I found bore S. 60 W. those points of the rocky Mountain were covered with Snow and the Sun Shown on it in such a manner as to give me a most plain and satisfactory view. whilst I viewed these mountains I felt a secret pleasure in finding myself so near the head of the heretofore conceived boundless Missouri; but when I reflected on the difficulties which this snowey barrier would most probably throw in my way to the Pacific Ocean, and the sufferings and hardships of my self and part in them, it in some measure counter ballanced the joy I had felt in the first moments in which I gazed on them; but as I have always held it little Short of criminality to anticipate evils I will allow it to be a good comfortable road untill I am compelled to beleive otherwise." I'm not much of a spiritual person, perhaps even less so than your average economist. But I do think that it is easy to spend an inordinate amount of one's time counting up problems and slights and injustices, past, present and future. In comparison, it requires (at least for me) some discipline and effort to count one's blessings. But the blessings matter more. I hope this holiday season and the year to come can feel like a good comfortable road for you. If carbon capture and storage could be accomplished at a reasonable cost--and that "if" is absolutely enormous--the implications for the question of climate change are extraordinary. At least some of any needed reduction in emissions could happen while still burning fossil fuels. The Australian-based Global CCS Institute describes the potential and the issues facing carbon capture and storage in its annual report, The Global Status of CCS--2013. For the record, this Institute was established in 2009 with initial funding from the government of Australia, and its members "include national governments, global corporations, small companies, environmental non-government organisations, research bodies and universities." It seems to me a bit of a cheerleader for the potential of carbon capture and storage approaches, but it still offers a useful overview of where the technology stands at present. Beyond the electricity sector, it is unlikely that energy–related and process CO2 emissions can be eliminated without CCS. This is because CCS is the only large–scale technology available to make deep emissions cuts in several industrial sectors (such as iron and steel and cement). Industrial sector emissions account for more than 20 per cent of current global CO2 emissions. It follows that the widespread deployment of CCS in the power and industrial sectors in the coming decades is imperative to achieving a low–carbon energy future at least cost." large–scale injection and geological storage of CO2 has been safely performed in saline reservoirs for more than 15 years, and in oil and gas reservoirs for decades. There are currently 12 operational large–scale CCS projects around the world, which have the capacity to prevent 25 million tonnes a year (Mtpa) of CO2 from reaching the atmosphere. The key technical challenge for widespread CCS deployment is the integration of component technologies into successful large–scale demonstration projects in new applications such as power generation and additional industrial processes." "More than 90 per cent of the overall cost of CCS can be driven by expenses related to the capture process. ... There is a variety of R&D programs focused on developing new and more cost-effective capture technologies. For example, the US DOE’s National Energy Technology Laboratory (NETL) has R&D programs designed to explore new solvents, membranes, and sorbents that could be used for CO2 capture. These programs focus strongly on developing technologies at the bench scale, and then funding their transition through to pilot scale." "For CCS to meet the longer term climate challenge of restricting global warming to less than 2°C, the estimated magnitude of the CO2 transportation infrastructure that will need to be built in the coming 30–40 years is 100 times larger than currently operating CO2 pipeline networks." "[T]here is an urgent need for policies and funded programs that encourage the exploration and appraisal of significant CO2 storage capacity." "Between 2008 and 2012, 'policy leader' governments committed more than US$22 billion in direct funding to large–scale CCS demonstration projects. ... In late 2009, the scale of funding support being considered globally exceeded US$30 billion. However, as the global financial crisis deepened, some funding mechanisms were cancelled before they could be legislated ... To date, not all of the available funding has been taken up. In several jurisdictions, some of the funding is no longer available due to legislative limits or changing government priorities. In some situations, the value of available government commitments has decreased due to the structure of funding mechanism or the funding is difficult to access due to the design of programs. In total, funding commitments have been reduced by more than US$7 billion ..."
"CCS is at something of a crossroads. For those immersed in a highly challenging environment with often slow-moving funding and policy commitments, it would be very easy to put the commercial deployment of CCS in the ‘too difficult’ basket. However, for those with an eye to the very real challenges of creating a sustainable low–carbon energy future, the commercial deployment of CCS is non-negotiable. The value proposition for CCS does exist, but it is complex and challenging to communicate ..."
I finished the report feeling that the hurdles in front of carbon capture and storage becoming commercially viable were every bit as large as I had previously thought, if not larger. But there is some interesting work happening: a report in the December 2013 of Scientific American described some research in which carbon dioxide is injected into underground basalt formations, where minerals would interact with the carbon dioxide to turn the carbon into a solid--thus eliminating any risk it might leak out in the future. The risk of adverse climate change scenarios from higher carbon emissions is substantial enough that no possible solutions, even partial solutions, should be neglected. As so many of us pass through airports at this time of year, contemplate the Transportation Safety Administration. The politics of creating the TSA were straightforward. The terrorist attacks of September 11, 2001, occurred. By November 2001, the Aviation and Transportation Security Act was passed into law, creating the TSA. This looks like a classic example of that old benighted syllogism of public policy: "Something must be done. Here is something. Therefore, it must be done." Chris Edwards reviews the history and makes the case for "Privatizing the Transportation Security Administration" (Cato Institute, Policy Analysis No. 742, November 19, 2013). "TSA’s main activity is operating security screening at more than 450 commercial airports across the nation. The agency also runs the Federal Air Marshal Service (FAMS), analyzes intelligence data, and oversees the security of rail, transit, highways, and pipelines. TSA has 62,000 employees and an annual budget in 2013 of $7.9 billion." screening itself is carried out by three expert private firms—G4S, Garda, and Securitas—which are each responsible for a group of particular Canadian airports." There's an old but useful rule for deciding when a certain desired activity should be carried out by government itself or instead if the government should pay others to do it: "Government should steer, not row." Or to put it another way, do I feel more secure in a situation where undercover government inspectors are continually testing private airport security companies, who know they are likely to lose their contract if they fail to perform? Or in a situation where I'm depending on one branch of government to inspect the security efforts of another branch of government, with all the inter-bureaucratic incentives not to embarrass each other, and where no one in a position of authority is going to lose their job or their annual bonus if security fails to perform? In addition to pure security issues, a contracting approach to airport security has other possible benefits. One is that a contracting firm has better incentives to provide friendly and rapid customer service than does a government agency that can't be fired. Another is that local control allows more rapid adjustment of schedules across the 450 airports for days and times when demand is high or low, compared with a rule in which all such adjustments need to be cleared with a faraway bureaucracy. Improved methods of providing security--either less time or different equipment--are more likely to emerge from private firms competing for work at airports across the county than from a federal bureaucracy. Not unexpectedly, Edwards cites a litany of reports that suggest poor management at the TSA. Out of 240 federal agencies, the TSA ranked 232nd in employee satisfaction. A GAO report found large increases in employee misconduct at TSA. A former TSA chief has reported that the agency is "hopelessly bureaucratic." The TSA bought 207 "puffer" machines to detect explosives, but then decided they didn't work well and mothballed them. Before TSA bought the full-body scanners, GAO requested that ti do a cost-benefit study, but none was done. In June 2011, a federal judge required that such a study be done, but it still hasn't been done. At least one outside study suggests that the machines would fail a cost-benefit analysis quite dramatically. Maybe we needed more airport screeners in the aftermath of 9/11, although I'm not familiar with any evidence on the point. But did we need the number of airport security screeners to more than double from 16,000 before the TSA to more than 40,000 immediately after, and 53,000 today? The 2001 legislation allowed airports to opt out, and five immediately did so--with San Francisco being the largest. Now there are 16 airports that have opted out, and others are applying to do so. There's no evidence that the airports which have opted out of the TSA are any less secure. And there aren't any airports moving the other direction, from privatized airport security to join up with the TSA. If the TSA can't be abolished outright, at least such opt-outs can be allowed and encouraged. My mental model of what is exchanged in international trade is getting an attitude adjustment. Traditional discussions of international trade are often based on examples of countries exporting products which are then consumed in other countries: cars, computers, wine, clothing, and so on. But in the modern economy, what is often exported across national borders is an intermediate good, which is then used in production of other intermediate goods and exported again, so that the ultimate product was produced as part of a global supply chain reaching across countries. The collection of essays in Global value chains in a changing world, edited by Deborah K. Elms and Patrick Low, offers a nice overview. The book was published by the World Trade Organization, together with the Fung Global Institute and Nanyang Technological University. "Global supply chains have transformed the world. They revolutionized development options facing poor nations; now they can join supply chains rather than having to invest decades in building their own. The offshoring of labour-intensive manufacturing stages and the attendant international mobility of technology launched era-defining growth in emerging markets, a change that fosters and is fostered by domestic policy reform. This reversal of fortunes constitutes perhaps the most momentous global economic change in the last 100 years. Global supply chains, however, are themselves rapidly evolving. The change is in part due to their own impact (income and wage convergence) and in part due to rapid technological innovations in communication technology, computer integrated manufacturing and 3D printing." Baldwin argues that these global supply chains represent a profoundly different form of international trade. In what he calls "the first great unbundling"--that is, the growth of world trade from the early 19th century through much of the 20th century--the gains from trade results from cheaper transportation costs combined with innovation, specialization, and economies of scale.The advantages of complexity and scale seemed to be coordinated best when production was clustered in a relatively few places. The result was that economic activity became clustered: for example, in the global North rather than the global South, and in certain regions and metropolitan areas rather than others. The "second great unbundling" of global supply chains is driven by different factors: declining costs of communication and information technology made it possible to coordinate economic activities happening in many different locations, and the large differences in wages that had built up over the decades across the countries of the world meant that splitting up work could reduce costs. "Some of the coordination costs are related to communication, so the `coordination glue' began to melt from the mid-1980s with ICT’s melding of telecommunications, computers and organizational software. ... While technology transfer is an ancient story (gunpowder), ICT facilitated control that reduced the costs and risks of combining developed-economy technology with developing-nation labour." In this form of international trade, economic activity becomes less clustered, and expertise spreads out. ... [in] what I call Factory Asia, Factory North America, and Factory Europe." As one measure of these shifting patterns, Baldwin points out that the G-7 economies--the United States, Canada, France, Germany, Italy, Japan, the United Kingdom--represented 20% of global output in 1820, 40% of global output in 1870, and peaked at two-thirds of global output in 1988, but have now fallen back to 50% of global output. Baldwin also argues: "Internationalizing supply chains also internationalized the complex two-way flows that used to take place only within factories." Thus, decisions about how to invest that used to happen inside plant or perhaps in a certain local region are now decisions about foreign direct investment. Transportation of parts and supplies used to happen inside a company: now much of that transportation is outsourced to logistics companies that provide shipping services. Services like legal and finance that used to happen within a company, and often even within the same building, now often become international transactions. Decisions about how to move intellectual property into the production line used to involve people from neighboring buildings, but now it involves decisions about sharing intellectual property and appropriate training across international borders. And the political economy of trade changed, too. In the older forms of international trade, there was always a temptation to protect domestic industries by shutting out imports. But in global supply chain trade, there is an incentive to make it ease for imports to arrive as part of the global value chain, and an expectation that other countries will behave in the same way. This process of global value chains is really just getting underway, and it may turn out to be more of a kaleidoscope of shifting patterns than a unidirectional movement. There will continue to be advantages of proximity to suppliers of inputs and to sources of ultimate demand. On the other side, continuing improvements in information and communications technology will tend to encourage further separation of economic activity, along with the growth of products that are valuable and technology-intensive but are small and have low cost to ship--or in the case of products like software or certain services, the "products" can be shipped electronically at almost zero cost. These forces will vary for different products. They will change with new developments in technology, like computer-guided manufacturing or equipment that can be operated by specialists who are geographically far away (remote surgery, anyone?). The forces will also change according to the ways that areas specialize in different kinds of production. My sense is that when economic historians 50 or 100 years from now look back at this time period, our daily policy concerns like the slow recovery from the Great Recession, health care finance, the euro, and others will have faded with time. Instead, the creation of global supply chains and the transformation of global economic patterns, along with what it means for countries and workers, will seem like the defining economic event of our time. In the world of economic theory, and sometimes in the minds of employees, the chief executive officer of a company is an all-seeing, all-knowing planner with a ruthless eye on the bottom line. However, it appears that the average CEO has a typical career trajectory: spend a few years cleaning up the past investment mistakes of the firm, then start expanding the firm's investments again, and finish off by over-expanding--so that the next income CEO has a bunch of investment mistakes to clean up, and the cycle can start anew. Yihui Pan, Tracy Yue Wang, and Michael S. Weisbach provide the evidence in "CEO Investment Cycles," which was published as national Bureau of Economic Research Working Paper #19330. NBER working papers are not freely available online, although some readers will have access through library subscriptions, but a readable summary of the paper is available here. Pan, Wang, and Weisbach collect data on 5,420 CEOs who took office in 2,991 publicly traded US firms between 1980 and 2009. They gather data on whether a departing CEO does so for reasons of age or health, or under some particular pressure. They also have data on whether the CEO is hired from inside or outside the firm. They don't look at the profits reported by firms, in part because profit data is at least as much an outcome of past decisions rather than current ones, and in part because profit data is often so massaged by corporate tax attorneys that it actual economic meaning can be unclear. Instead, they look at the annual patterns of investment by firms. "We estimate the magnitude of the CEO cycle in terms of the differences in disinvestment, investment, and firm growth, between the first three years of a CEO’s tenure and the later years, holding other factors constant. The magnitude of the changes in firm investment and growth over the CEO cycle is substantial. For example, the annual investment rate (investment-to-capital-stock ratio) tends to be 6 to 8 percentage points lower and the asset growth rate tends to be 3.2 percentage points lower in the first three years of a CEO’s tenure than in his later years in office. Given that the median investment rate in our sample is 24% and the median asset growth rate is 7.6%, the differences in investment and growth between the earlier and the later parts of the CEO cycle are clearly non-trivial. The effect of CEO cycle on investment is also of the same order of magnitude as the effects of other factors known to influence investment such as the business cycle, political uncertainty, and financial constraints." Their preferred explanation is that when CEOs are first appointed, they are under pressure from the board of directors to be the ruthless profit-seekers of legend. But over time, as the CEO appoints more members of the board of directors, the CEO feels less of this pressure and has a tendency to over-invest. "First, when a CEO takes office, he will have incentives to divest poorly performing assets that the previous CEO established and was unwilling to abandon. Second, for many reasons, CEOs usually prefer their firms to grow, potentially at the expense of shareholder value maximization. The board of directors is an important constraint on CEOs’ ability to deviate from the shareholders’ interest. However, as the CEO becomes more powerful in the firm over time, he will have more sway over his board and will be able to undertake investments that maximize his utility, potentially at the expense of value. Eventually, when the CEO steps down, the process is repeated by the next CEO. ... We measure the CEO’s capture of the board by the fraction of the board that is appointed during his tenure, and find that the increasing CEO influence on the board over his tenure explains the positive relation between CEO tenure and investment. ... In addition, we find that the quality of a firm’s investments, measured by the market reaction to acquisition announcements, decreases with CEO tenure and becomes negative during the later portion of his time in office. The deteriorating investment quality is also related to the CEO’s control of the board." They also seek to evaluate some of the possible alternative explanations. But they find, for example that this pattern holds even when the turnover of the CEO is due to death, illness, or retirement--and thus it just that boards fire CEOs who aren't performing well. They also find this effect both for CEOs hired from inside and from outside the firm, and for firms where the industry is being hit by big positive or negative surprises. To me, the analysis makes CEOs sound a bit like coaches of sports teams: they arrive to clean up the mistakes of the past regime, but over time many of them gradually drift into their own set of mistakes. It also suggests that firms should think seriously about the independence of their boards of directors and about rotating the CEO on a semi-regular basis. One suspects that the cozy relationships between CEOs and the directors they have appointed is not just manifested in the firm's investment choices, but may well show up in executive compensation and other firm decisions, too. To calculate a worldwide measure of income inequality, you need to work with data on the distribution of income for the population in every country--and for many countries, this data is mismatched and helter-skelter. You need to convert the income data for all countries into a common currency, like U.S. dollars. You then add up all the people in the world who fall into each income category. To do comparisons over time, you need to find data for different countries over time, and then also adjust for inflation. Christoph Lakner and Branko Milanovic of the World Bank take on this task in "Global Income Distribution From the Fall of the Berlin Wall to the Great Recession," published this month as Policy Research Working Paper 6719. 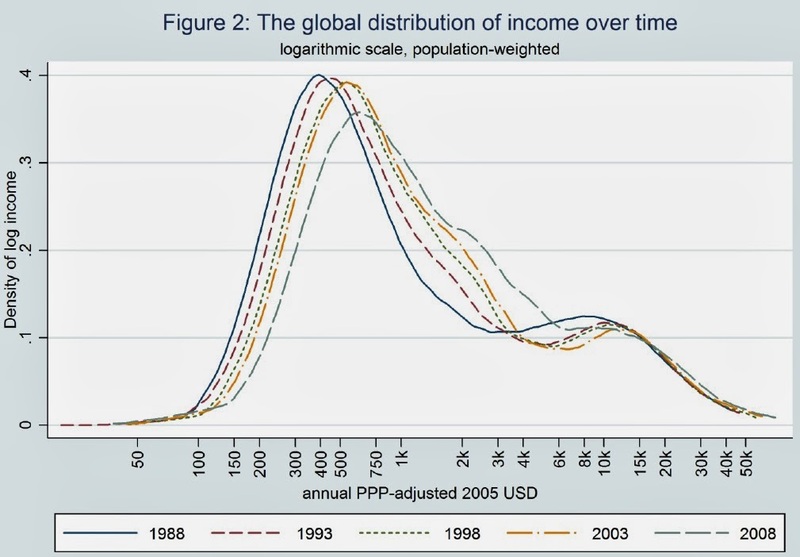 Here's how the global distribution of income has shifted over time. 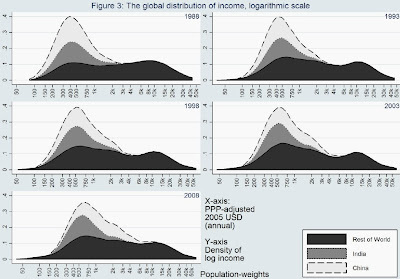 It used to be said back in the 1960s that the global distribution of income was bi-modal--that is, it had one hump representing the large number of people who were very low-income and then a smaller hump representing those in the high-income countries. 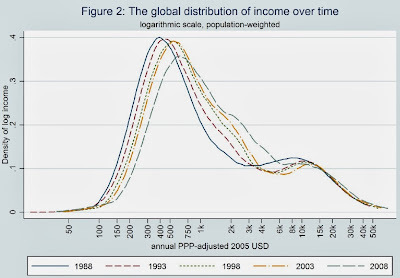 In the blue line for the global distribution of income 1988, the remnants of that bimodal distribution are still visible. But over time, the highest point in the income distribution is shifting to the right, and by 2008, the world has moved fairly close to having a unimodal or one-hump distribution of income. An obvious question here is to what extent these changes are about what has happened in China and in India, which after all combine to include about one-third of the world's population. Here's a figure showing the shifts over time, with the population of India and China shaded separately. 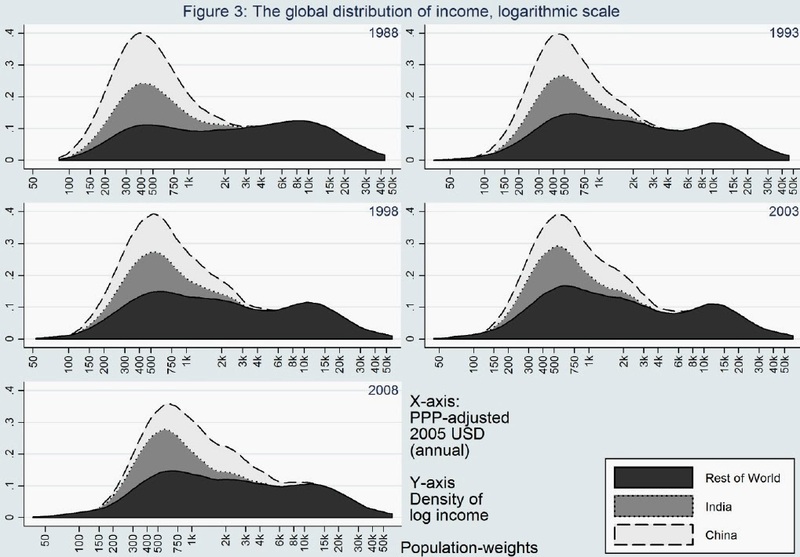 You can see that the shift in the shape of the global income distribution an largely be traced to India and China. In particular, you can see that the hump to China is pretty much centered over the hump for India in 1988 and 1993, but by 2008, the hump for China is now shifting to the right more than the hump for India, reflecting China's faster rate of economic growth. One final thought: In interpreting these charts, it's important to remember that the horizontal axis measures income on a logarithmic graph. That is, instead of each horizontal distance representing the same absolute gain in income, it represents the same proportional gain income. Starting from the left, the horizontal distance from $50 to $100 is the same as the distance from $100 to $200, which is the same as the distance from $200 to $400, or if you look off to the right, the sqame as the distance from $10K to $20K. In other words, relatively small movements to the right on this graph represent large changes in absolute value of incomes, especially as you get to the center and far-right of the graph. Note: Hat tip to Howard Schneider at the Washington Post Wonkblog, where I saw the Lakner-Milanovic working paper mentioned. "As a gross oversimplification, current thought can be divided into two schools. The fresh water view holds that fluctuations are largely attributable to supply shifts and that the government is essentially incapable of affecting the level of economic activity. The salt water view holds shifts in demand responsible for fluctuations and thinks government policies (at least monetary policy) is capable of affecting demand. Needless to say, individual contributors vary across a spectrum of salinity." "To take a few examples, [Thomas] Sargent corresponds to distilled water, [Robert] Lucas to Lake Michigan, [Martin] Feldstein to the Charles River above the dam, [Franco] Modigliani to the Charles below the dam, and [Arthur] Okun to the Salton Sea." For those not up on their southern California geography, the Salton Sea is the largest lake in California. It is formed by the occasional long-ago overflow of the Colorado River, but it has no natural outlet--except for evaporation. Thus, as various kinds of salinity wash through the soil and into the Salton Sea, its salinity kept rising, making it saltier than the ocean. As Hall points out, the old-style differentiation between monetarists and Keynesians was based on views about the effects of monetary and fiscal policy. Keynesians back in the 1950s typically believed that the supply of money and credit was not an important factor in determining the business cycle. Monetarists like Milton Friedman argued that it was. By the mid-1970s, the monetarists had won that argument and Keynesian thinking of that time often discussed both fiscal and monetary policies. As Hall wrote in 1976: "The old division between monetarists and Keynesians is no longer relevant, as an important element of fresh-water doctrine is the proposition that monetary policy has no real effect. What used to be the standard monetarist view is now middle-of-the-road, and is widely represented, for example, in Cambridge, Massachusetts." At a more detailed level, Hall attributed much of the difference between the freshwater and saltwater macroeconomists to their views on expectations. In the freshwater view of that time, it was typically argued that economic actors had excellent foresight about the future effects of various policies--what is often called "rational expectations." In certain economic models with rational expectations, adjusting the money supply has no effect, because all economic actors can see what i happening and adjust all prices and wages accordingly. As Hall wrote in 1976: "By now, everyone more than a few yards from the ocean's edge bows in the direction of rational expectations." But how much rationality was really likely? As Hall drily noted, some of the models seemed to presume that all economic actors had rationality "[e]qual to that of an MIT Ph.D. in economics with 9 years of professional experience." But even at that time, economists were experimenting perspectives on macroeconomic behavior. Some economists used information lags, in which people might take time to develop their rational expectations. Others thought about "adaptive expectations," in which people looked backward at what had happened, but didn't make forward-looking predictions in the way that true rational expectations would require. Still others looked at reasons why prices or wages might not adjust, with a particular focus on contracts or other kinds of "sticky prices," which would later grow into a "New Keynesian" saltwater view of the economy. As Hall wrote: "Macroeconomists of more brackish persuasions are skeptical of the explanatory value of information lags, and have developed a major alternative within the framework of rational economic behavior. The basic idea is that buyers and sellers of labor services rationally enter into contracts that fix the wage in money terms for some time into the future." There was a time, not all that long ago back in the mid-2000s, when a number of economists thought that they had successfully put together a consensus macroeconomic model. It built on the freshwater ideas that macroeconomic models should be built on microeconomic behavior and the important of expectations of individual agents, while still allowing for the possibility of saltwater ideas like the stickiness of prices, the economic losses from recessions, and a role for government policy in ameliorating recessions. For one explanation of these efforts at building a consensus model, see the article by Jordi Galí and Mark Gertler in the Fall 2007 issue of the Journal of Economic Perspectives, "Macroeconomic Modeling for Monetary Policy Evaluation." Just to be clear, a shared model doesn't mean that macroeconomists would all agree. It means that economists with differing perspectives can use the same overall structure for analysis and argue about whether certain parameters have high or low values. This focuses the intellectual disputes in a useful way. But this consensus model, like pretty much all existing macroeconomic models, failed the test of providing a useful framework for understanding the Great Recession. The freshwater and saltwater camps separated again. Here is one quibble with what Hall wrote back in 1976. He argued: "As I see it, the major distinguishing feature of macroeconomics is its concern with fluctuations in real output and unemployment. The two burning questions of macroeconomics are: Why does the economy undergo recessions and booms? What effect does conscious government policy have in offsetting these fluctuations?" At the time when Hall was writing, this statement seemed accurate to me. The very idea of macroeconomics as a distinctive field grew out of that extraordinary recession called the Great Depression, and in the following decades up to the mid-1970s, the concern over economic fluctuations largely defined the field of macroeconomics. But although this change wasn't yet visible in 1976 when Hall was writing, the U.S. economy had just entered a lengthy period of productivity slowdown. We were in the process of witnessing a period of enormous economic catch-up from Japan, soon to be followed by Korea and other nations of East Asia, and now in turn being echoed by rapid growth in China, India, and other emerging economies. Looking ahead, the U.S. economy faces challenges about whether it can return to and sustain a strong rate of growth into the future. In the aftermath of the Great Recession, many of the old arguments about causes of business cycles and policies for ameliorating them have obvious relevance. But to me, macroeconomics should also be about the long-term patterns of economic growth. Life expectancies are rising, but how healthy will people be in those additional years of life? The debate over "compression of morbidity" asks whether people who live longer will experience more years of illness, or the same number of years of illness, or even fewer year of illness. Of course, if people experience fewer years of illness before death, it would have enormous social effects, including lower spending on health care and long-term care services for the elderly, as well as a greater ability of the elderly to participate actively in their families, their communities, and the workforce. There's some evidence that compression of morbidity is in fact occurring. "Health status in the year or two just prior to death has been relatively constant over time; in contrast, health measured three or more years before death has improved measurably. ... We show that disability-free life expectancy is increasing over time, while disabled life expectancy is falling. For a typical person aged 65, life expectancy increased by 0.7 years between 1992 and 2005. 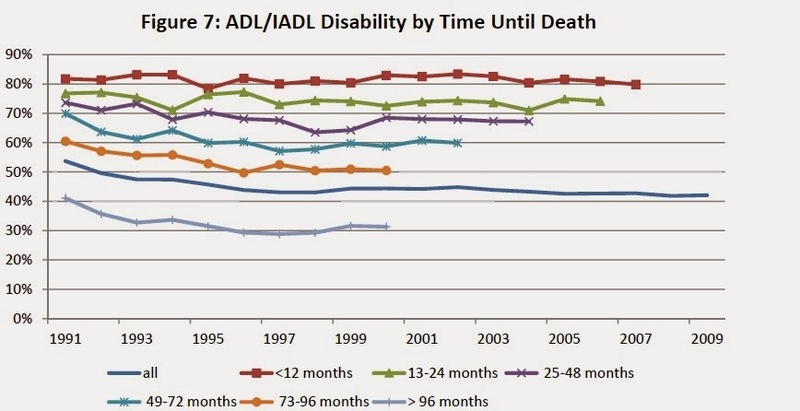 Disability-free life expectancy increased by 1.6 years; disabled life expectancy fell by 0.9 years. The reduction in disabled life expectancy and increase in disability-free life expectancy is true for both genders and for non-whites as well as whites. Hence, morbidity is being compressed into the period just before death." Here's an illustration of one of their findings. The solid blue line shows the rate of Activities of Daily Living (ADLs) and Instrumental Activities of Daily Living (IADLs) for the entire group. ADLs include basic activities like feeding and dressing yourself, or going to the bathroom. IADLs include broader functioning activities like grocery shopping, housework, and phone calls. 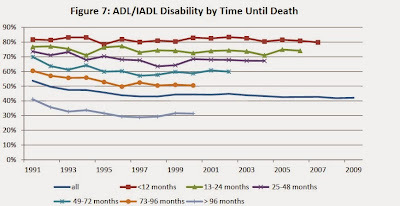 The top two lines show that the proportion of Medicare beneficiaries who turn out to be within a year or two of death have reporting these disabilities at pretty much the same rate over time. But Medicare beneficiaries who are further from death are reporting these disabilities at a lower rate. The same morbidity in the couple of years before death, but lower morbidity for those further from death, means that compression of morbidity is occuring. There's also some evidence that the rate of dementia or Alzheimer's disease in older age groups is declining in a number of countries. 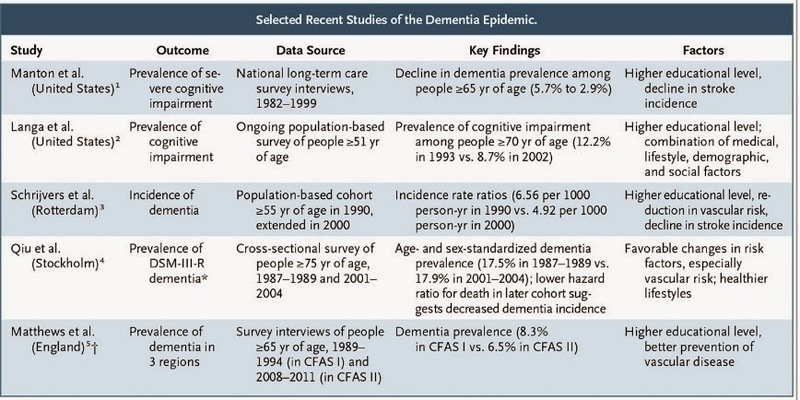 Eric B. Larson, Kristine Yaffe, M.D., and Kenneth M. Langa summarize this evidence in "New Insights into the Dementia Epidemic," appearing in the December 12 issue of the New England Journal of Medicine. 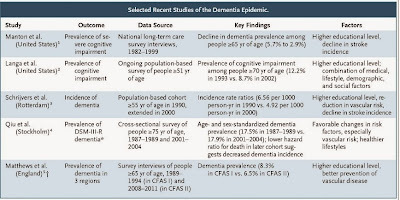 Of course, a falling rate of dementia means that the chance of getting Alzheimer's can be reduced by various factors. They write: "But for now, the evidence supports the theory that better education and greater economic well-being enhance life expectancy and reduce the risk of late-life dementias in people who survive to old age. The results also suggest that controlling vascular and other risk factors during midlife and early old age has unexpected benefits. That is, individual risk-factor control may provide substantial public health benefits if it leads to lower rates of late-life dementias." End of the wonderful one-hoss-shay. Logic is logic. That's all I say. Last summer I heard a talk on compression of morbidity (not by any of the authors above) and the speaker memorably said: "We already have the magic pill that produces compression of morbidity. It's called exercise." In December 1938, one of the most eminent economists of the time, Alvin E. Hansen, delivered the Presidential Address, titled "Economic Progress and Declining Population Growth," at the annual meetings of the American Economic Association. Looking at the economy of the late 1930s, Hansen wrote:"This is the essence of secular stagnation--sick recoveries which die in their infancy and depressions which feed on themselves and leave a hard and seemingly immovable core of unemployment." The idea of "secular stagnation" has received considerable attention in the last month after it was involved in a talk given by Larry Summers at an IMF conference as a framework for thinking about the discomfiting state of the economic recovery. A round-up of some commentary and responses to the Summers talk is available here. In this post, I'll sketch out what Hansen actually said, give a sense of why the "secular stagnation" hypothesis was widely disregarded in recent decades, and suggest how I see the modern lessons. Hansen argued that an economy needed strong and healthy levels of investment if it was to maintain full employment. He wrote: "For it is an indisputable fact that the prevailing economic system has never been able to reach reasonably full employment or the attainment of its currently realizable real income without making large investment expenditures." opportunities adequate to maintain full employment. ... It is my growing conviction that the combined effect of the decline in population growth, together with the failure of any really important innovations of a magnitude sufficient to absorb large capital outlays, weighs very heavily as an explanation for the failure of the recent recovery to reach full employment." Indeed, Hansen argued that in some cases, new technologies might even lead to less need for invention: "Moreover it is possible that capital-saving inventions may cause capital formation in many industries to lag behind the increase in output." In a modern context, one can imagine certain ways in which the growth of information technology makes capital investment more effective and efficient--and thus reduces the need for certain other kinds of investment spending. Further, Hansen was skeptical about whether either monetary or fiscal policy could provide a long-lasting answer. He was skeptical that lower interest rates could encourage the large and vigorous investment levels that he felt were needed: "Less agreement can be claimed for the role played by the rate of interest on the volume of investment. Yet few there are who believe that in a period of investment stagnation an abundance of loanable funds at low rates of interest is alone adequate to produce a vigorous flow of real investment. I am increasingly impressed with the analysis made by Wicksell who stressed the prospective rate of profit on new investment as the active, dominant, and controlling factor, and who viewed the rate of interest as a passive factor, lagging behind the profit rate. This view is moreover in accord with competent business judgment. ... I venture to assert that the role of the rate of interest as a determinant of investment has occupied a place larger than it deserves in our thinking. If this be granted, we are forced to regard the factors which underlie economic progress as the dominant determinants of investment and employment." maladjustments without the removal of which we cannot attain a workable cost-price structure, and therefore we fail to achieve the otherwise available flow of private investment." Thus, a short summary of Hansen's theme was that a healthy full-employment economy needs strong profit-oriented incentives for investment spending, and because he was not confident that the economy of his time could produce such incentives, secular stagnation was the result. When we look back at Hansen's speech of late 1938, we see the issues of his time a little differently. Of course, Hansen does not have access to the luxuries of 20:20 historical hindsight and modern economic statistics. For example, Hansen discusses a slowdown in population growth, which was certainly a fair reading of the trends at that time, but completely missed that US fertility rates were about to take off less than a decade later at the start of what we call the "baby boom." Hansen was concerned that technological progress had slowed in the 1930s, and that the age of new inventions driving forward the economy was over. In retrospect, the notion that technological innovation stopped in the 1930s seems clearly incorrect. Indeed, Alexander Field makes a very plausible case in his 2012 book, A Great Leap Forward: 1930s Depression and U.S. Economic Growth, that the 1930s experienced a great deal of technological growth. At a macro level, Field points out that essentially the same number of people were employed in 1941 as in 1929, using what seems to be the same value of capital stock, and yet real output was one-third or more higher in 1941 than in 1929--implying substantial productivity growth even with the period of the Great Depression taken into account. If one just looks from 1933 to 1941, real U.S. GDP gained 90% over those eight years. At the micro level, Field points to high and rising R&D investment during the 1930s, dramatic improvements in roads and rail, and a long list of technological improvements in areas like chemicals, electricity generation, cars, planes, and many more. Here's an readable interview with Field laying out his views. In contrast, Hansen seemed to perceive the later 1930s as nothing but the long aftermath of the the Great Depression. But current dating of business cycles suggests that that the Great Depression ended in March 1933. After a few years of fairly vigorous recovery, the Federal Reserve, chasing a premonition of a shadow of a ghost of possible inflation that no one else could see, decided to raise interest rates, triggering a severe recession starting in May 1937 that lasted through June 1938. Field and others have argued that the U.S. economy was on a strong and healthy path of recovery before and after the Fed-induced recession of 1937-38. By the late 1960s, when unemployment was less than 5% from March 1965 through June 1970, the idea that the U.S. economy was necssarily trapped in secular stagnation looked plain unrealistic. Yet here we are in late 2013, more than four years after the Great Recession technically ended in mid-2009, but without a real resurgence of catch-up economic growth that has followed other recessions. We also have the disturbing example of Japan's economy, which suffered a financial crisis and melt-down in real estate prices back in the early 1990s, and has now been stuck in slow growth for more than two decades. Hansen's spirit would surely point out that a surge of population growth or an expansion of territory are unlikely. Thus, much turns on investment spending. Here's a figure generated by the ever-useful FRED website maintained by the St. Louis Fed. It shows Gross Private Domestic Investment (GDPI) divided by GDP. Investment often drops during recessions, and sometimes between recessions, but the investment drop during the Great Recession was especially severe, and the bounceback even to usual levels is not yet complete. Moreover, the investment surge of the mid-2000s was largely in residential real estate, and whatever the other virtues of such investments, additional houses don't do much to raise future rates of productivity growth. "The problem of our generation is, above all, the problem of inadequate private investment outlets. What we need is not a slowing down in the progress of science and technology, but rather an acceleration of that rate. Of first-rate importance is the development of new industries. There is certainly no basis for the assumption that these are a thing of the past. But there is equally no basis for the assumption that we can take for granted the rapid emergence of new industries as rich in investment opportunities as the railroad, or more recently the automobile, together with all the related developments, including the construction of public roads, to which it gave rise. Nor is there any basis, either in history or in theory, for the assumption that the rise of new industries proceeds inevitably at a uniform pace. The growth of modern industry has not come in terms of millions of small increments of change giving rise to a smooth and even development. Characteristically it has come by gigantic leaps and bounds. Very often the change can best be described as discontinuous, lumpy, and jerky ... And when giant new industries have spent their force, it may take a long time before something else of equal magnitude emerges. ... [A] vigorous recovery is not just spontaneously born from the womb of the preceding depression. Some small recovery must indeed arise sooner or later merely because of the growing need for capital replacement. But a full-fledged recovery calls for something more than the mere expenditure of depreciation allowances. It requires a large outlay on new investment, and this awaits the development of great new industries and new techniques. But such new developments are not currently available in adequate volume ..."
I worry that the current U.S. economic policy agenda is all about fiscal and monetary policy, along with financial regulation and health insurance. I hear relatively little discussion focused directly on an agenda for creating a supportive environment for private domestic investment. Ultra-Low Interest Rates: Who Wins? Who Loses?